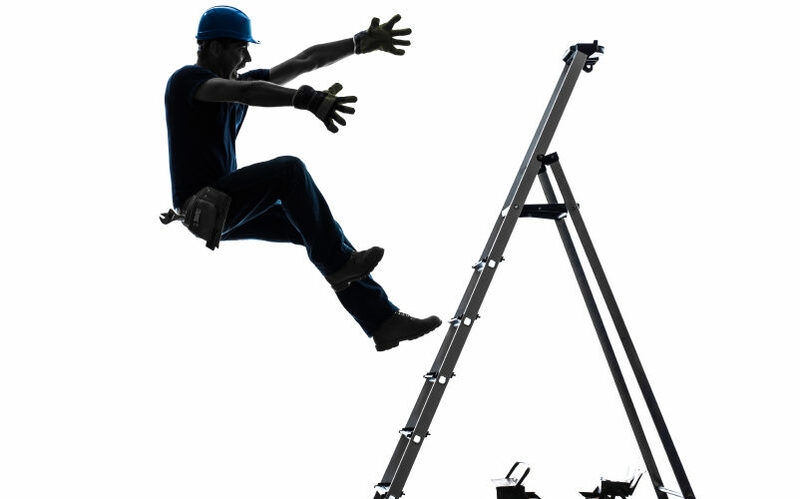 How do you prevent falls from ladders? Implement a comprehensive safety program. – Understand OSHA ladders regulations. – Train workers to identify hazards associated with ladders. – Use safe work practices. – Portable ladders not 3 feet above landing surface. – Not securing ladder correctly. – Standing on the top two steps of a stepladder. – Overreaching when working from a ladder. Ladders shall not be loaded beyond the maximum intended load for which they were built nor beyond their manufacturer’s rated capacity. Extension ladders should be used at a 4 to 1 pitch. For every 4 ft. (1.2 m) in height, the bottom of the ladder should be 1 ft. (.3 m) away from the structure. When accessing another level, the ladder must extend at least 3 ft above the landing to provide a handhold for getting on and off the ladder. Only use in the fully open position on firm level ground. Do not use a stepladder that is folded or in a leaning position. Never sit/stand on the top two rungs. Consider work height when selecting a stepladder. Face the ladder when ascending or descending. Maintain three points of contact at all times. Keep your body centered on the ladder. Never let your belt buckle pass either siderail.